Holly Holm has sense enough to fear Ronda Rousey, but also the bravery to believe that her own skill can bring her victory at UFC 193. Holly Holm must be confident in her skills to take on UFC bantamweight Ronda Rousey on increasingly short notice, but it isn’t because she underestimates the undefeated champion. In fact, the former boxing world champion knows full well that Rousey is dangerous at just about every range in a fight. "She’s got a well-rounded game," Holm told Inside MMA, recently. "I’m not going in there thinking, ‘Oh, I only have to worry about … grappling.’ I do know [Rousey] has knockout power so I don’t feel like you guys are going to see what you’ve seen before with her. I fear everything about her. Stand up, ground, clinch, all that. And, I feel like that’s the way you need to be with any fighter." True enough. 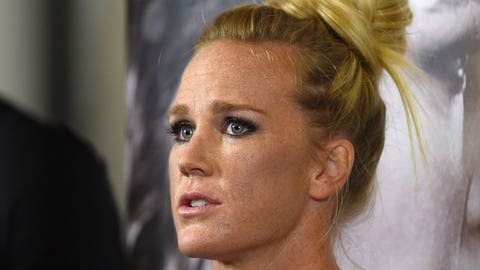 Holm is honest to reveal what ever fighter knows, regardless of whether they admit in in public — that there are moments of very real fear in every athlete as they head into a contest. Fear and understanding of the bad things an opponent can do to you is what prompts one to train to shore up weaknesses and prepare tactics to counter threats. So, even though Holm "fears" Rousey, we must remember that training to respond assertively to feelings of fear is precisely what fighters do. That is to say, Holm likely believes that she can take the Rowdy one out. Being a huge underdog to Rousey doesn’t daunt the world-class striker. After all, she’s been in that position many times before. "I’m going in as the underdog and there’s been many a time where I’ve been in this situation so, I think that’s helped me a lot," she said. "Everybody is beatable. Is it going to be hard as heck? Absolutely. It’s going to be the hardest fight of my career. I have to absolutely do everything right from the beginning to the end of the fight. "Is it going to be easy? No. That isn’t what I’m saying. But, I’m going in there to win and it’s very possible."